Cooking for me has always been a little bit more than putting a few ingredients into a pot. I grew up with women who listened to the particular bubble of a pot. My grandmother used to say (this is a literal translation): “When the stew gets enough spirit in it, it’s time to put the dumplings in.” The word dukh, which means “spirit” and is related to dusha, meaning “soul”, has always been part of my food-making, but it’s been very casual – something I never analysed, just did. 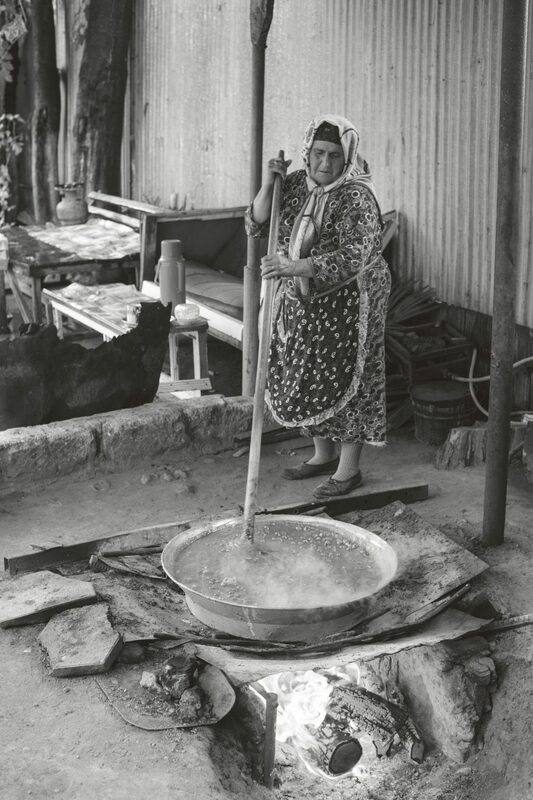 When we arrived in Lankaran, an Azerbaijani city near the southern border with Iran, we were immediately told that a special dish was being prepared for us by three women and that they had started making it at five in the morning. We were to be taken there and help them finish cooking it. It was already 12 noon. So from five in the morning, three women in their late 60s or 70s had been stirring something in a huge cauldron suspended over a roaring fire. You may think Macbeth, but it was a much more positive affair. The reason why I mention the women’s ages is because while they were engaged in those eight hours of continuous stirring, they were ageless, as fit and full of spirit as any 20-year-old I met that week. They were making samani khalvazi or wheat halva. Traditionally lots of wheat berries would be left to sprout, and as soon as the white sprouts appeared, they were cooked in a pot over fire. Kilos of sugar would be added and the pot continuously stirred for eight hours. There are now only a handful of women in each village who have the knowledge and skill to make this dish. Wheat is of course a sacred symbol of birth and abundance. So samani khalvazi is not a dish that is cooked casually. It is only ever made if there is a serious intention, an active wish to be made, such as wishing to get pregnant or wishing for someone to get better. As you stir, you think about your intention, and with every rotation of the oar-like wooden spoon, you will come closer to its materialization. I loved this labour-intensive but meditative way of cooking; it’s these meditative qualities of cooking that have made me fall more deeply in love with it. At first it was a necessity – try dicing 5kg (11lb) of chillies in a restaurant kitchen and not fall into a trance. It would be torture, and really boring. But allow yourself to lose your mundane thoughts and dream instead, and your containers are filled with perfectly diced chillies within an hour, and perhaps you have also untangled something in your heart and mind. Repetition of a single action is both mesmerizing and therapeutic, and making hundreds of those tiny dyushbara dumplings (see page 111) are the representation of my sanctuary, my expression of love. Another colourful tradition in Azerbaijan is the making of fisinjan – a chicken and pomegranate dish that in some parts of the country is most desirable when it becomes black. How do they make it black? They throw a horseshoe into the pot with the stew to oxidize it! Not only do they do that, but also shout at the tops of their voices something along the lines of: “I wish the neighbour’s daughter falls in love and runs away with a man!” Forget Tinder, get your Auntie to make you fisinjan Azerbaijan-style. And if no suitor appears, at least both of you would have had a side-stitching laugh and a delicious lunch.